I know. January 1st came and you set for yourself a goal. 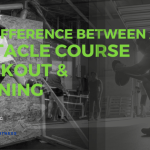 Whether that be to run a 5, 10, 15K; an obstacle course race like Spartan Race; or simply to run “more,” let me guess–you were doing great until curtains of rain started falling from the sky. You’re not alone. 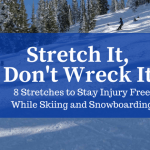 Many of us give up when the weather is bad, which is why I’ve compiled a number of tips to help you lace up and hit the pavement even when the storms roll in. 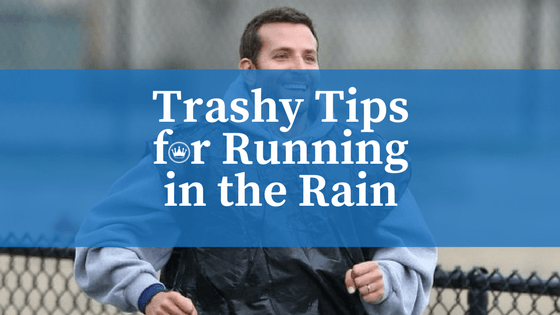 Here are my favorite trashy tips to help you keep training even when it’s raining. Invest in a visor and running gloves. A visor will keep the rain out of your eyes, and a pair of running gloves will keep your hands warm. If you get hot, stuff the gloves in your shorts or shirt. Skip the shower cap. Unless you’re running on Halloween or just enjoy getting weird looks from the neighbors, I don’t recommend using a shower cap to keep your head dry. Neighborhood watch groups are no joke. Wear waterproof. A waterproof jacket can make all the difference in the world. There are a lot of waterproof breathable jackets out there in the lightweight category. Your best bet is going to your local running store where you can try on a variety of styles and determine what fits your body best. Go Robin Hood. Robin Hood and his men weren’t afraid of tights, and neither should you be. If you’re training in high winds, extreme cold or snow, or heavy rain, long tights will help moderate your body temperature. That being said, if the outside temperature isn’t freezing, or if you just run warm in general, you may want to choose capris so you don’t overheat. When wearing tights, you need to take into account the outside temperature and your average body temperature, not just the actual weather. Lube up. Don’t worry, no need for embarrassment here. I mean lube up your feet, which helps to avoid pruning. You should also lube other areas likely to chafe or blister. Bodyglide and Vaseline are effective tools in this endeavor. ‘Nuff said. Pack that bag. In your gear check bag, make sure you have an alternate set of warm, dry clothing. This includes clothes, socks, hats, and dry shoes. Consider including a towel, and some more trash bags to put your wet clothes into post-race. If you get cold easily, you may even want to include several instant heat packs. These heat packs can be placed inside gloves or pockets to warm up hands, or you can purchase the sticky kind and apply to your body where heat is most needed. In the end, you can’t change the weather. But, you can change your outlook. The day may bring you rain, winds, hail, or snow—just go with it—and find your silver lining, whatever that may be. 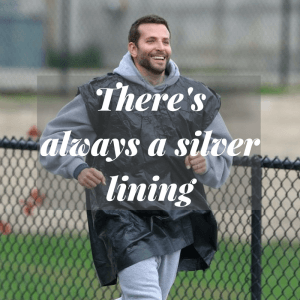 If all else fails, you can always blame Bradley Cooper.